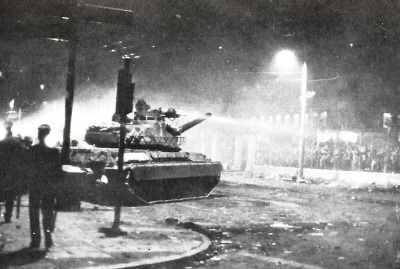 36 years ago, the fascists came to kill those who stood up for freedom and democracy. But for all their violence, they couldn’t kill the idea of freedom. This is what Greek people celebrate on the 17th of November. Today, it’s starting to become acceptable to excuse the crimes of the fascists in the name of “economic progress” and similar abstract and misleading concepts that have nothing to do with what happened to real people. This photo tells you everything about what happened to real people. Tanks happened. Slavery happened. And today, it’s happening all over the world.